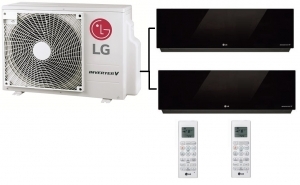 The LG MU2R17.UL0 is a multi-outdoor condenser unit using the latest R32 refrigerant that can have 2 artcool mirror indoor units fitted, either rated at 2.5kw or 3.5kw. These systems can provide full cooling and heating independently to 2 rooms with the added bonus of a dehumidification mode if required (Please not only 1 mode can be selected at once for all indoor units). The latest model artcool mirror units have a host of new features including dual protection filters to remove viruses and pollen spores as an example from the room air. Another new feature is the embedded Wi-Fi built into the indoor unit to allow Wi-Fi control if you should choose.